The naked mole can now add an honor to its impressive list of distinctions. The long-living, subterranean rodent has been named Vertebrate of the Year by Science Magazine, thanks to the work of University of Rochester biologists Vera Gorbunova and Andrei Seluanov. Science, one of the world’s leading journals on scientific research and news, notes that naked mole rats “will never win a beauty contest,” but “may hold a lesson or two for humans” when it comes to warding off cancer. While they may not appreciate the crack about beauty contests, naked mole rats have carved out a reputation for healthy living. They can last as long as 30 years and stay healthy right up to the end—and that includes never getting cancer. In fact, when naked mole rat cells are induced to form a tumor, the rodents stop the threat almost immediately. Gorbunova and Seluanov hope their work will one day lead to clinical treatments for preventing or controlling cancer in humans, but they caution that any medical solution is a long way off. One person closely following the work of Gorbunova and Seluanov has been University President Joel Seligman, who has often referred to their discoveries during his public speeches and written updates to the University community. 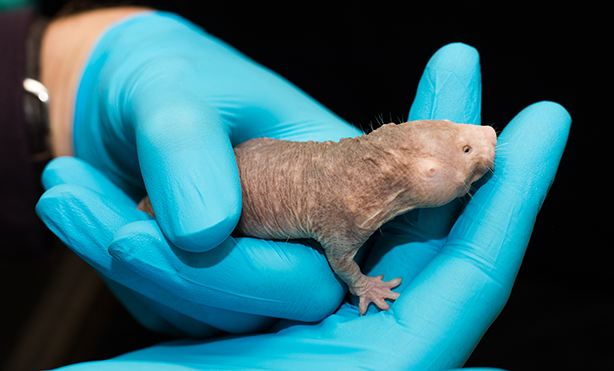 While the honor goes to the naked mole rat, Seligman said it’s a testament to the accomplishments of the researchers. As for the naked mole rats, Seligman admits that they do deserve to be acknowledged. “Here at the University, the naked mole rat seems like it has been the Vertebrate of the Year for several years,” said Seligman. Gorbunova and Seluanov are currently trying to apply naked mole rat-like adaptations to mice in order to test whether that would boost longevity and resistance to cancer in that rodent. There’s no word on whether the mouse is eyeing Vertebrate of the Year honors for 2014.